Whether the market is hopping or slowing to a pathetic crawl, if you’re thinking of selling your home, the more you do to make it move-in ready, the better your chances of selling the home in decent time — and getting top dollar for it. Interior paint colors play a big role in how desirable your house will appear to potential buyers. You may have bright pink walls in the playroom and dark walls in the guest room because that’s the way you like it, but when selling your home, the key is to create a blank canvas. That way, people can actually picture themselves in the space, without picturing you there instead. This doesn’t mean to paint everything white, though. Take a tour through the house to learn what paint colors go best in each room when you’re trying to sell your Orcutt home. The kitchen is one of the most important rooms in the house when you’re selling your home. Updated, functional kitchens are high on many home buyers’ lists. With that in mind, if you’re doing any updating in the room, make sure you choose a wall color that will sell. 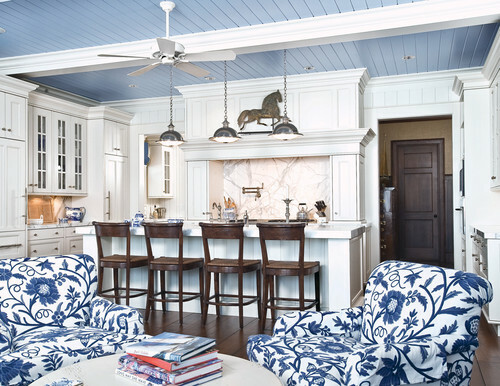 Blue is a favorite, and Zillow even found in a Paint Color Analysis that soft gray-blue kitchens sold for almost $2,000 more. Blue reigns supreme in the bathroom as well. Zillow found that light pale blue to soft periwinkle bathrooms are preferred, and homes with bathrooms in these colors sold for more than $5,000 more than expected. Break from the blue for a moment when you step into the living room. In this space, light beige, pale taupe, or oatmeal-colored walls are preferred. It’s back to blue in the bedrooms. Cadet blue, to be exact. This color helps homes fetch a higher price. If your home has a separate dining room, blue is going to be the color to paint it — no surprise here. Zillow found that homes with blue dining rooms sold for nearly $2,000 more than homes with white dining rooms. These cool neutral colors throughout the house make a home feel open, clean, and well-cared for. Plus, the colors are typically universally liked, so you don’t run the risk of somebody cringing when stepping inside your door. Instead, potential home buyers feel at ease and can take the time to visualize themselves and their things in your home. Style-specific colors on the wall, like dark terracotta dining rooms, tend to sell for less. And it makes sense. If a style or color is too specific — and that specification doesn’t match a home buyer’s taste — they’ll see your home as a house that needs work before they can feel comfortable there. If you’re selling your Orcutt home, take the time to create a beautiful blank canvas with appealing colors so that you can not only sell your home faster, but you can get more money for it. Let New Life Painting in California’s Central Coast help you get your home ready for the market. Give us a call at (805) 937-9836, or contact us online for a free estimate. Are Expensive House Paints Worth the Cost?